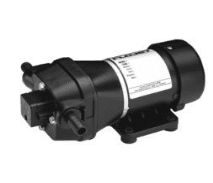 Flojet 4100 series pumps are suitable for a wide range of agricultural and industrial applications. With flow rates up to 18 LPM and pressure to 45 PSI the 4100 series pump range is suitable for boom spraying as well as application and transfer of many chemicals. The Flojet 4100-505 has an open flow rate of 14 LPM and is fitted with Viton check valves and santoprene diaphragms. 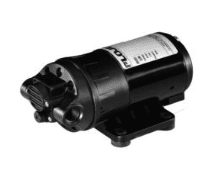 The Flojet 4100 series is a self-priming pump. It may be located several feet from the tank, above or below the liquid level (it is not a submersible pump). For vertical pump mounting be sure that the motor is located on top. 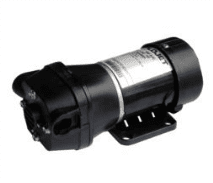 This will prevent water from entering the motor chamber in event of a leak. Compact design and plug-in port fitting make installation easy. Can run dry without damage and handle liquids up to 54° C.
No metal contact with liquid being pumped. 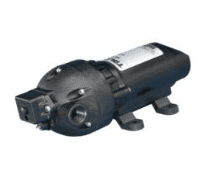 Ball bearing drive throughout pump and motor assures longer pump life. Excellent self-priming capability. Pump may be located above the liquid level. Powerful, permanent magnet motor with low current draw and long life brushes.